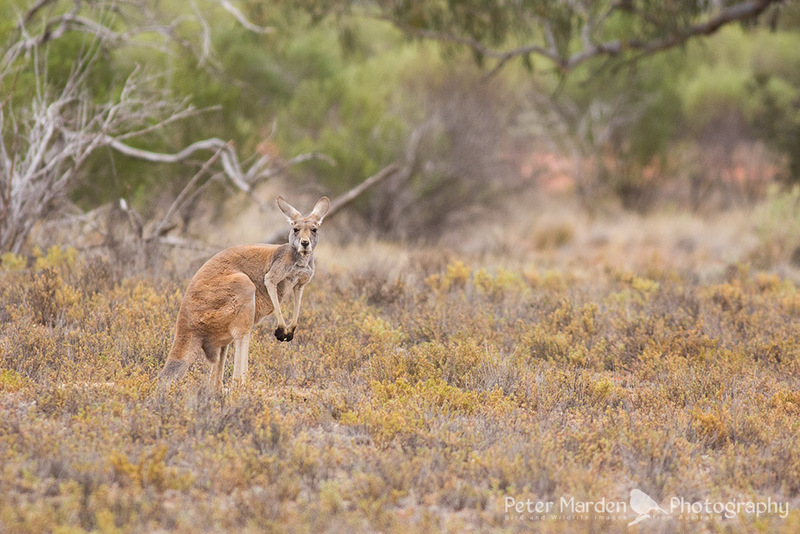 Part 2 of Adelaide to Kilcowera. As I mentioned we took a different route on the way back to camp, it was so we could go to a few of the other mentioned spots on the property. We headed for a place called Murderers bore, had a few stops on the way. 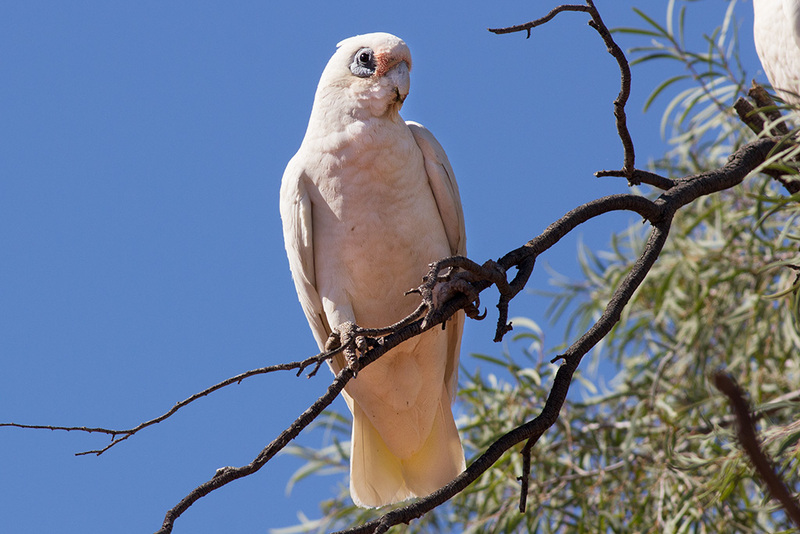 A bird that was pretty common in areas on the property is the Little Corella. As Rich and I wondered around the bore a bit, a lot more of the bird life became visable, a lot of finches were coming in for a drink, but were not too keen as we were there. We spent an hour or so there, then started to head back as there were not too many different birds coming in. 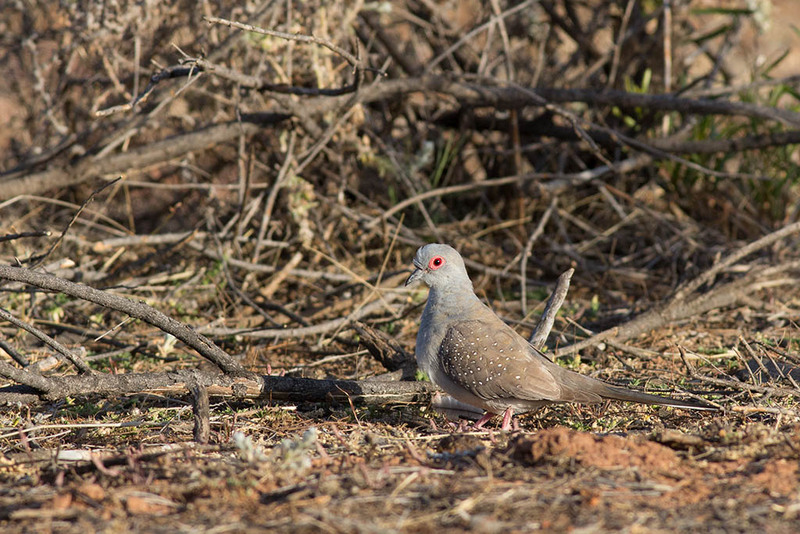 We got to within 200 metres of the gate to the camp and headed of to the right to see if we could get any Chats (Crimson), we saw a couple but no luck in getting any shots. 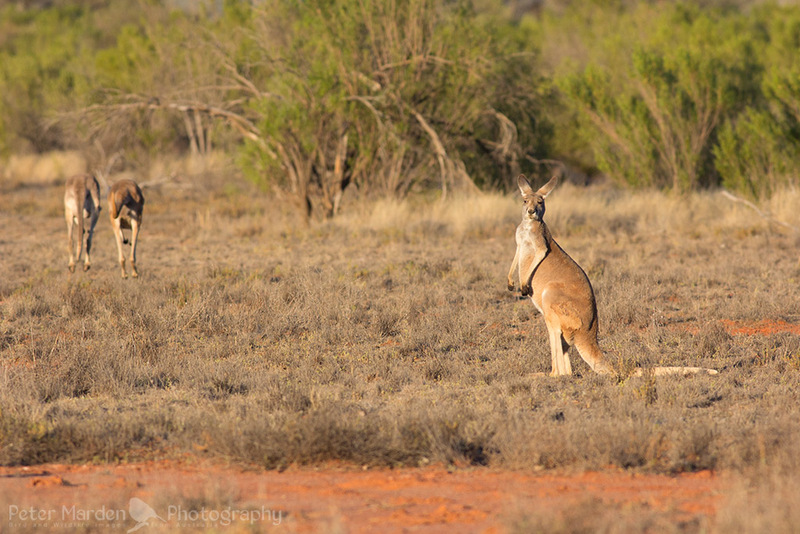 Some Emu’s came into view, yes there are quite a few as well as Kangaroo’s on the property. We grabbed a few shots of them as best we could. This was pretty well the end of this day for photography, so we headed to the camp to wash and have some grub. 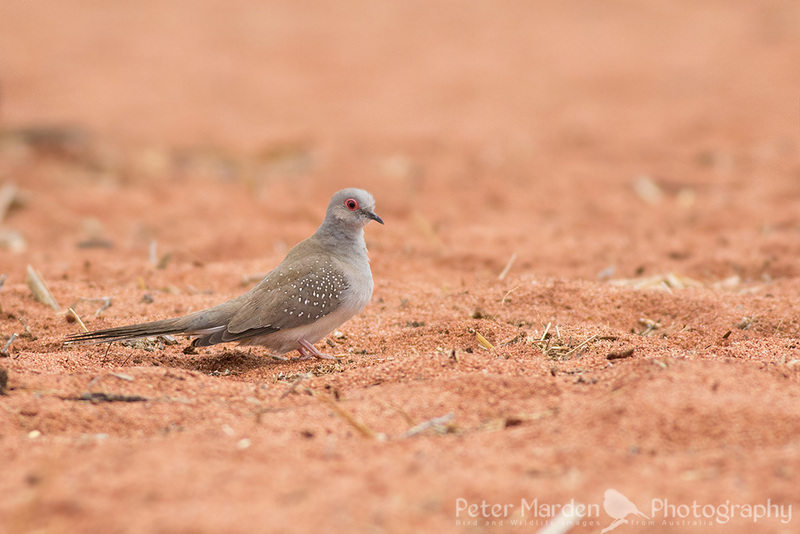 I rose once again just before day break, grabbed a drink and then went for a short walk around the cattle yard and bush area, the Major’s were out flying and so were quite a few spotted doves. 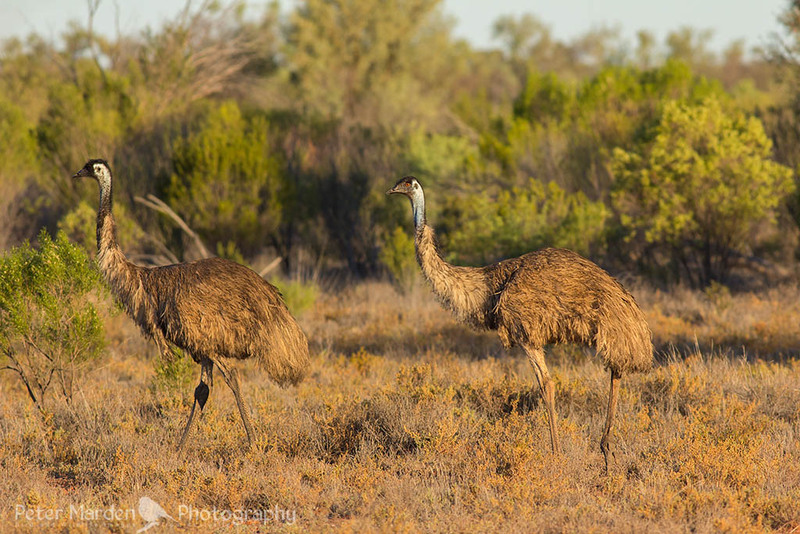 There were quite a few Emu’s within the large yard area, no real good images of them as it is very thick with bushes. 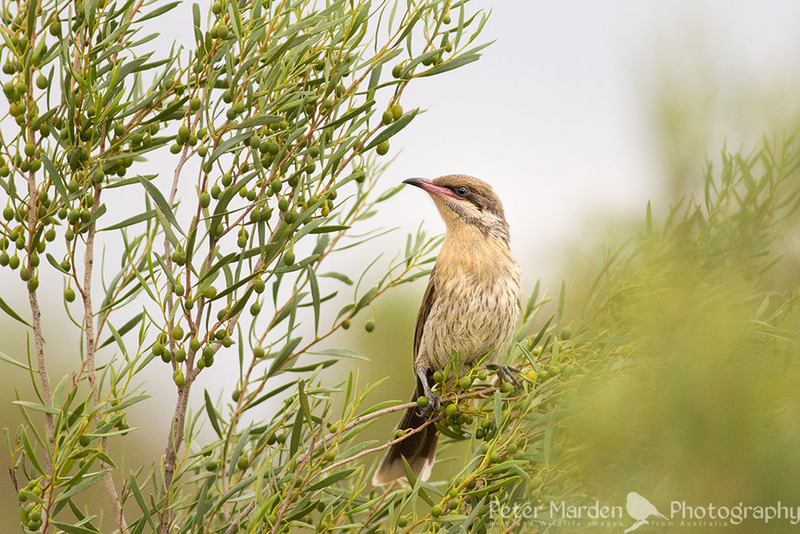 Once we had a bit of breakfast, we headed off to the road we checked out the Chats on, only saw the Chats from a bit more of a distance again, but we stopped at a bit of a bush area along the track, as it looked promising. 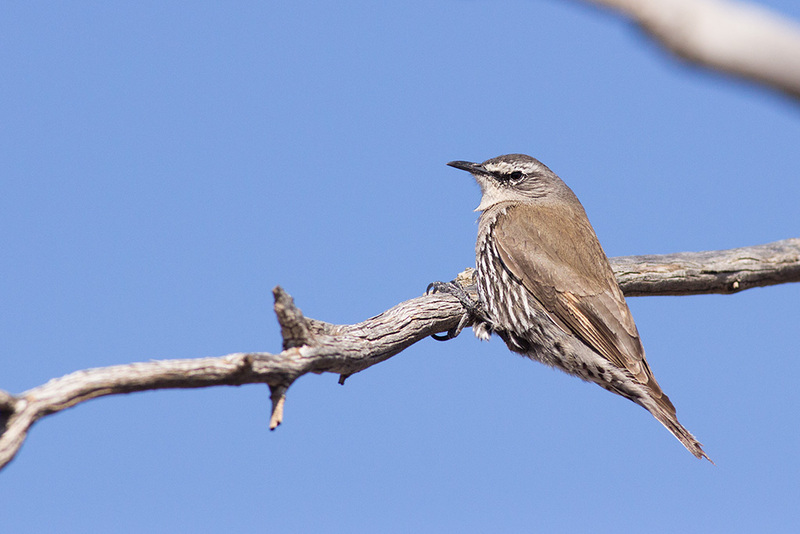 We heard a sound and sitting there was a White-browed treecreeper. We settled in for a bit of photoging once again, after about 50 shots. 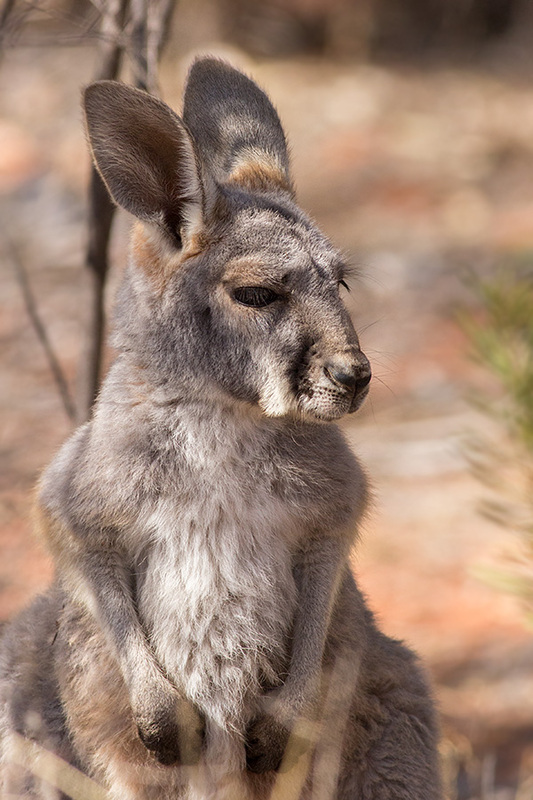 I left Rich to it as I had a little Red Kangaroo to try to photograph. This little fella did not want to look at me whilst in the bushes, if I went to look at him he would keep turning his head the other way, was a cute little fella, Mum was not far off watching. We slowly started to head back to camp to sort out with Toni to head to Zenonie Station. 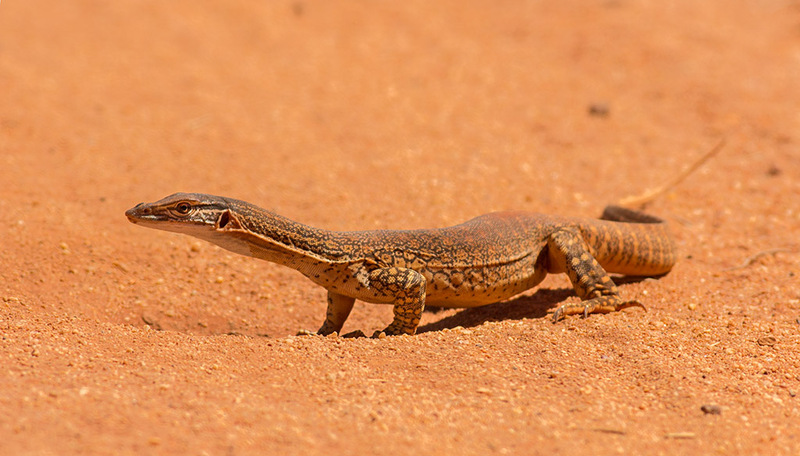 On the way back we saw this Goanna only just on the road, it was actually heading back into it’s hole, this happen to be in the road, the car is actually only a couple of feet away from him, it was that close to hitting him. We met up with Toni and she drew us a mud map of which way to go, we grabbed a bite to eat and then headed off, we had a few stops where Toni had mentioned to stop for hopefully bird life. As it was quite warm there were not too many birds out, First stop was a dam near the western border of the boundry. 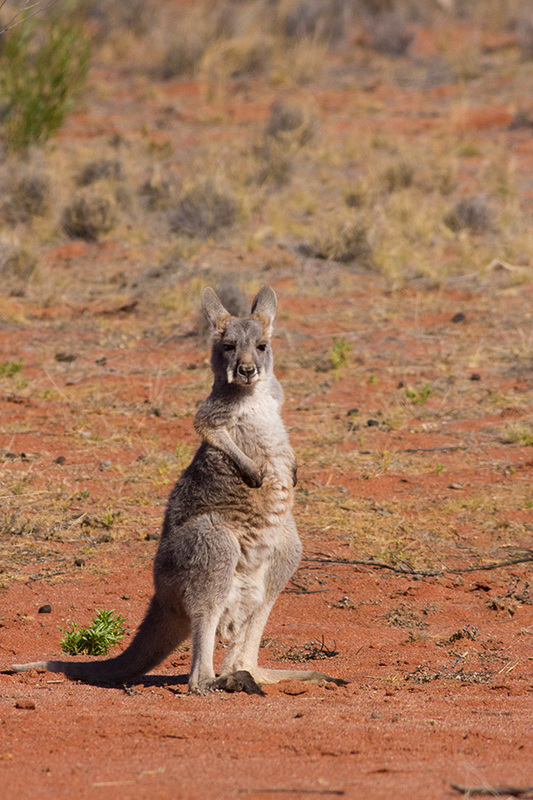 All that we saw there were some more Red Kangas. 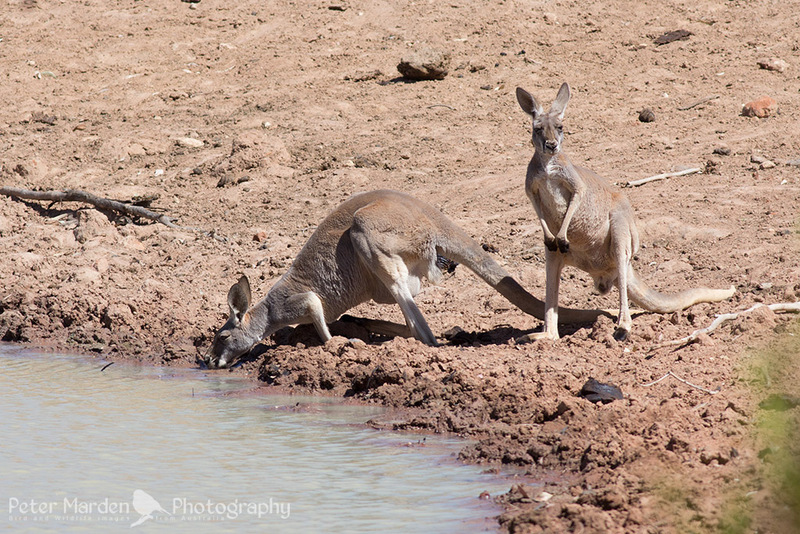 We headed off to the next dam, this was close to the main road, but once again just a few Roos and some Emu’s. 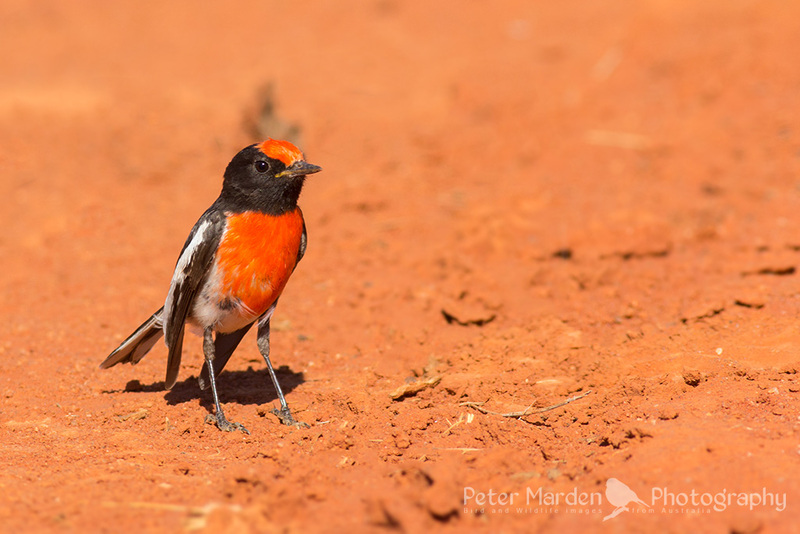 We finally got to the main entrance to Zenonie, as we were near on halfway along the drive way of a few ks we spotted another Red-capped Robin, we got quite a few shots of this one. It was pretty harsh light, but we managed reasonable shots. 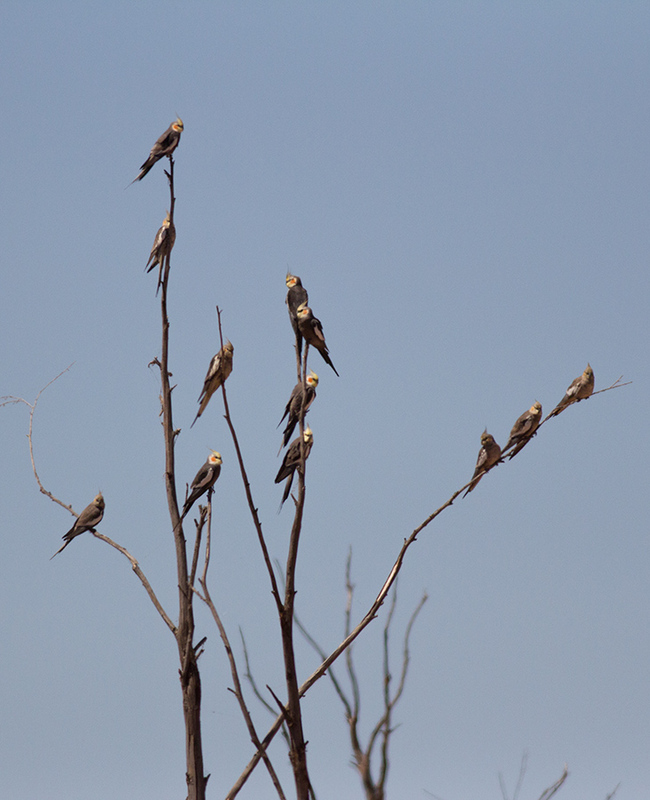 We finally got to the dam and tank on Zenonie and it was quite warm with a few Zebra Finches and Little Corellas flying around. After awhile i had a wonder around, I grabbed this shot of 3 images stitched to make this Panoramaof the old Shearing shed on Zenonie. The light was getting pretty bad around the dam due to shadows, so we called it quits and slowly headed back to camp. 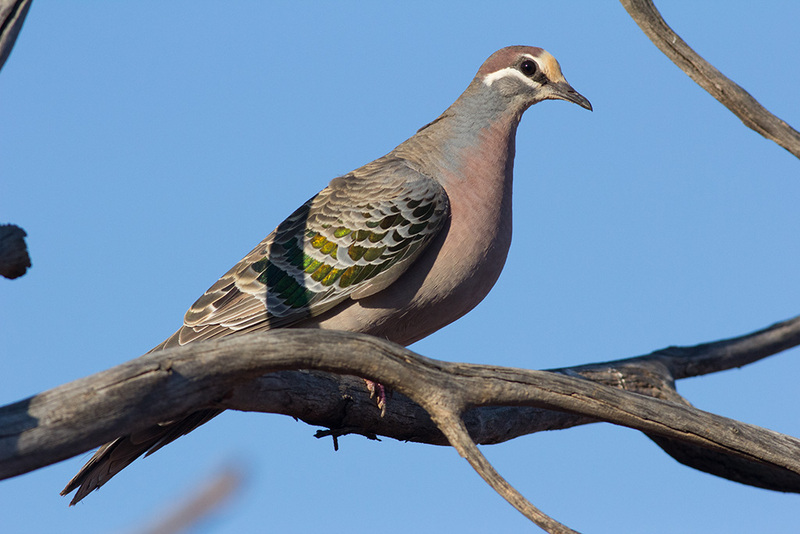 There were a lot of Bronzewing Pigeons just as we were about to leave, very heavy shadows were making it hard to get good shots, let alone the distance they were at. 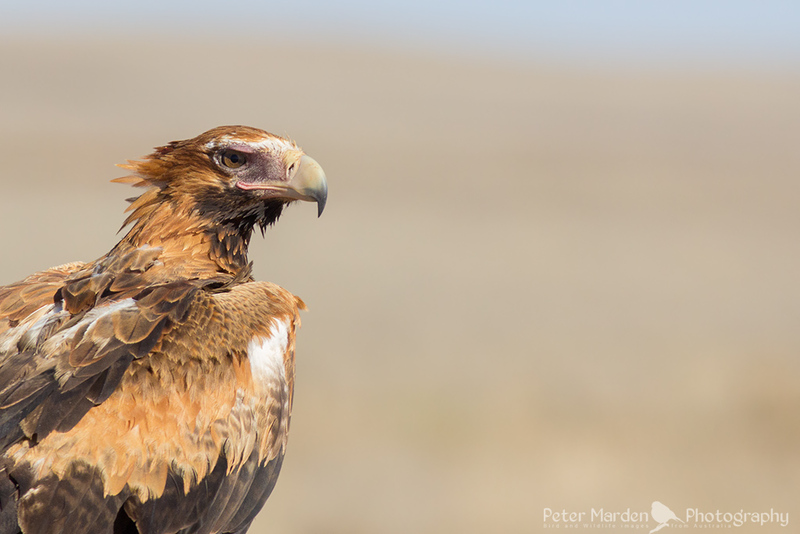 as I was heading back to the car, a Bronzie landed just about on my MFD (min Focal Distance). This shot is SOOC, not even cropped, nice to see them that close. We got back to camp right on dark, so a good wash and shower and then a nice feed, we transfered all our images as usual to the hdd and lappies. A nice cuppa and I think we headed out for a bit of spotting, but we saw nothing. back and hit the sack. On the 28th of September I went and picked up Richard Hall to start our 8 day trip to Kilcowera and back. We left Rich’s house at 1pm Saturday and headed to Yunta for the first over night stop. Whilst there we were able to have a bit of a look around for some birds in the area. 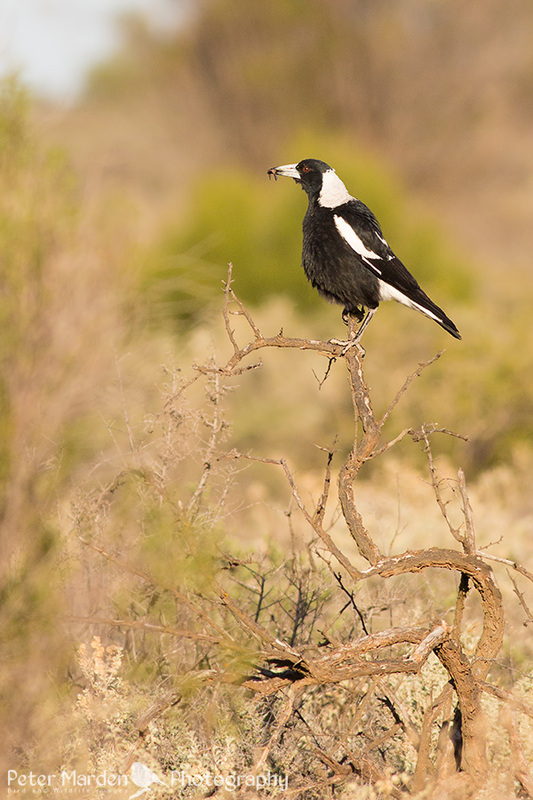 We got this Variegated Fairy-wren and this Australian Magpie ( black backed). 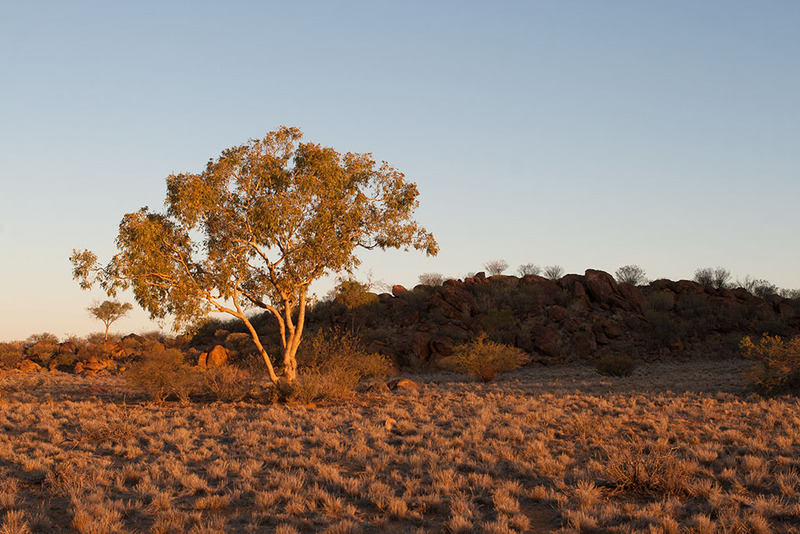 It was a nice nights stay, up early to head back into to Yunta for some Brekky and head on off to Tibooburra. 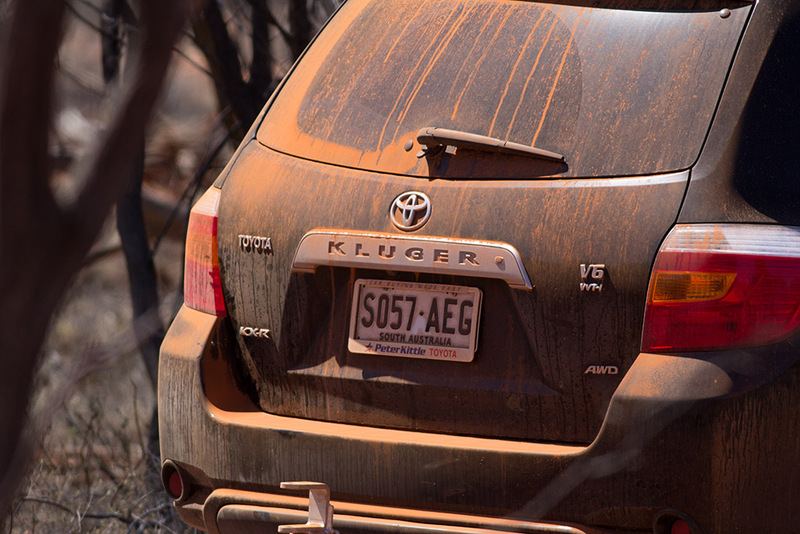 Took till around 4pm to get to Dead horse Gully at Tibooburra in Sturt NP. 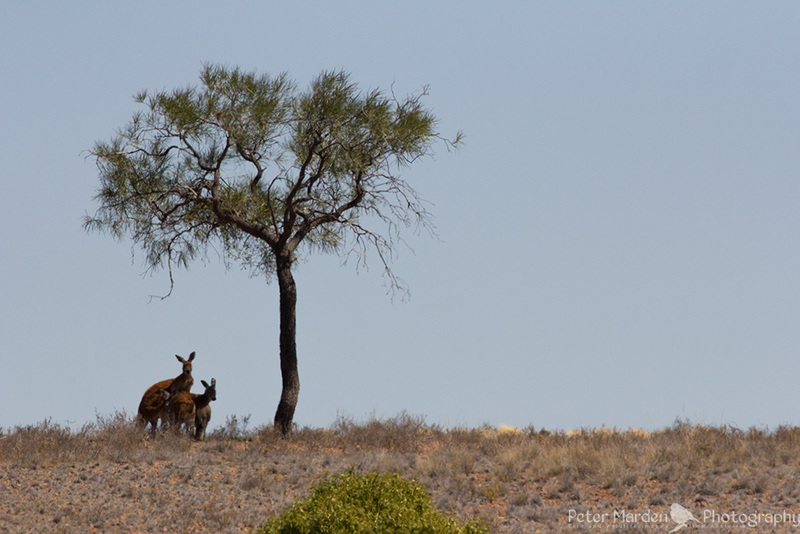 Some great scenery and a few wild critters, not too many birds at all at this stage. We had a bight to eat, Egg and Bacon toasted sandwich. Took off toward the border of NSW and QLD at Warri Warri gate. Took a few photos there of the gate etc. 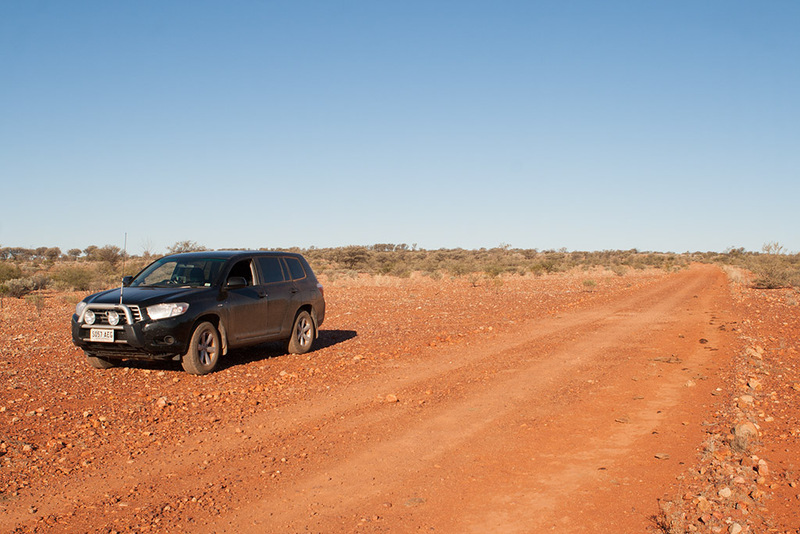 Some nice red soil in the area, miles of treeless plains along the next quite a few K’s of road. Now this stretch from Tibooburra onward we have to do by 4 pm to Kilcowera, it was a long drive with quite a few stops along the way, due to birds etc. We had stopped a few times before getting to Warri warri gate due to bird life seen, but about 1/2 an hour the other side of the gate in QLD was a sight we were not expecting. 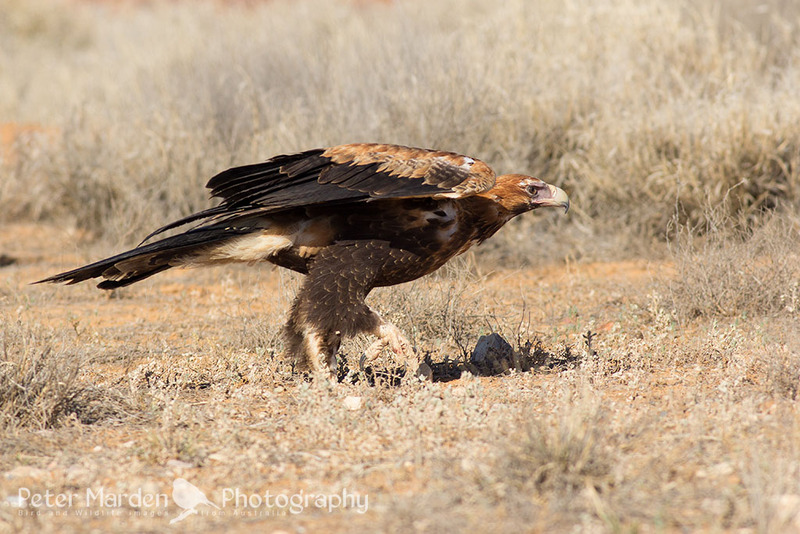 We saw 10 Wedge-tailed eagles on 1 road kill Kangaroo. The one thing I do regret is that I did not even think of getting my wide angle lens out to capture the amount of eagles. So I only got shots of single birds. As you can see this young bird allowed closer shots than most of the others. Was a great 10 minutes or so checking these out. 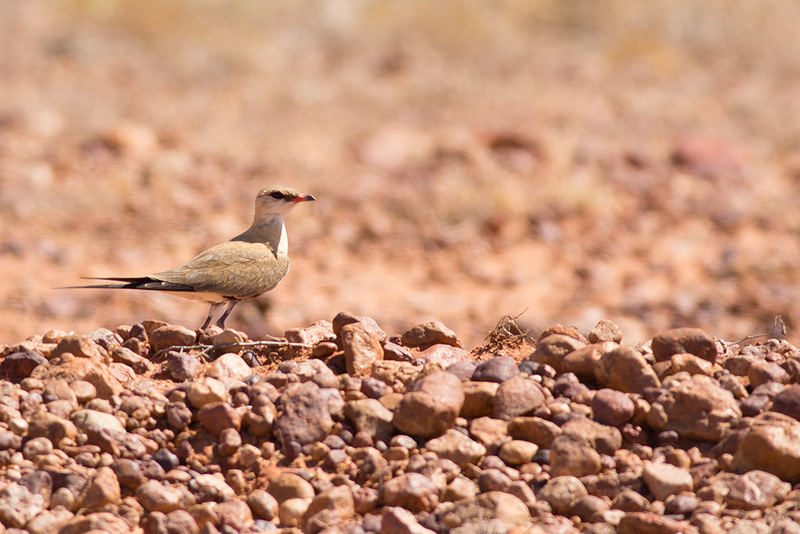 We were nearly at Noccundra when Rich saw these unusual birds flying, we knew exactly what they were Australian Pratincole’s, we stopped to get some images but they were not really playing the game, staying out of good photo range. The temp at the time of taking this shot, was around the 38 deg. quite warm and it was harder to get good shots due to the heat haze. Turned out not too bad, but some images do drop in quality due to it. We had finally got into Thargomindah for fuel, even though we carried 40 litres of fuel with us, we did not use it then. Mind you I had gone through quite a lot of fuel between Tibooburra and Thargomindah due to road condition weight and aircon. The other thing was that by the time we had reached Noccundra I had found that the anderson plug and trailer plug were missing, so bought a new lot at Thargomindah servo and repaired the units at Kilcowera. We had gotten into Kilcowera around the 3:30 pm SA time. This gave us time to meet with the owners of the property and setup camp. Once that was done we could do some discovering close to camp, as it was slowly getting darker. We drove to the end of the Lagoon spent a bit of time looking around there, quite a few Brown Treecreepers in the area. 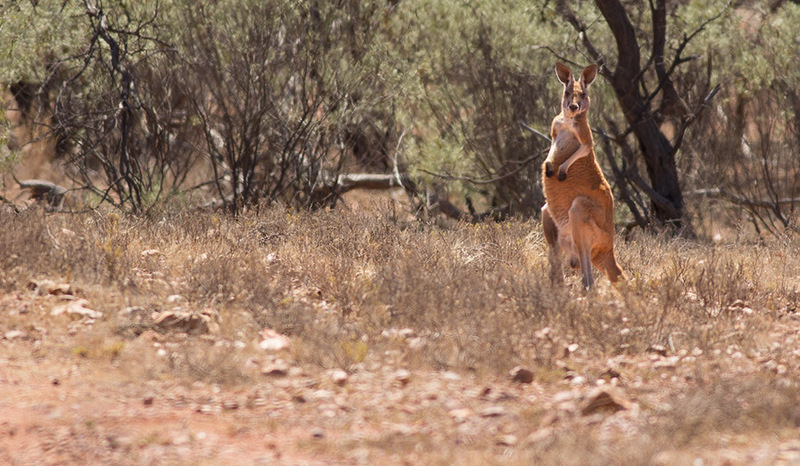 We then went to what was called the Red hole, along here we saw quite a few Kangaroos, Red’s. I got a few images. As it was getting a bit dark for photography for animals we went back to the camp. As the sun set, I was cooking our meal for the night and for the next day. So after our meal, I decided to get a few images of the sun setting from our camp site. As this day drew to an end, we were hoping for some excellent weather for the next few days, the Temp was 38 degs, we hoped that the temp would drop quite a bit to allow the bird life to be out a bit more, than hiding in the trees. 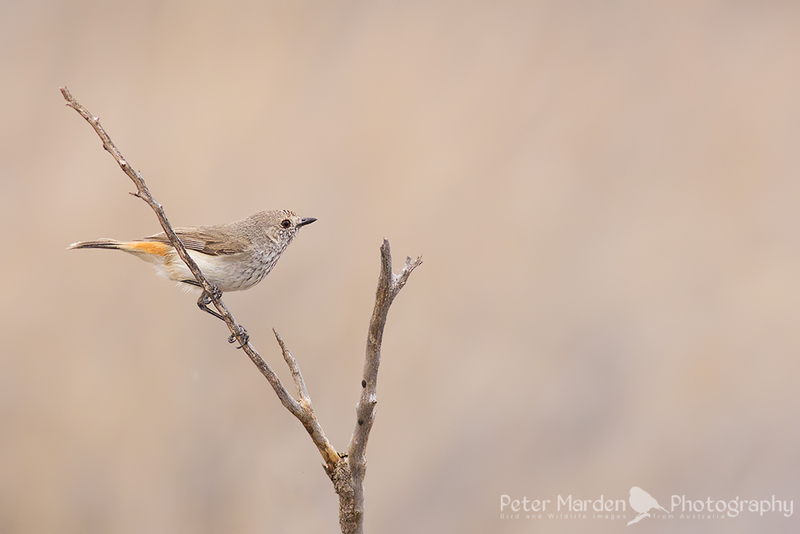 As they say Mad dogs and ______ well when you are birding like this, we are just as mad :-). The next morning I get up at 5:30 am SA time. I make a cuppa and then as the light got better, grabbed my camera and headed around the the old Shearing shed and cattle yards. Just to see what was about, there were quite a few birds around, so I tried to get some nice shots, but the light was pretty bad, heavy cloud cover and windy. I spent about 1/2 an hour wondering around by myself, this is a few of what I got for that time. 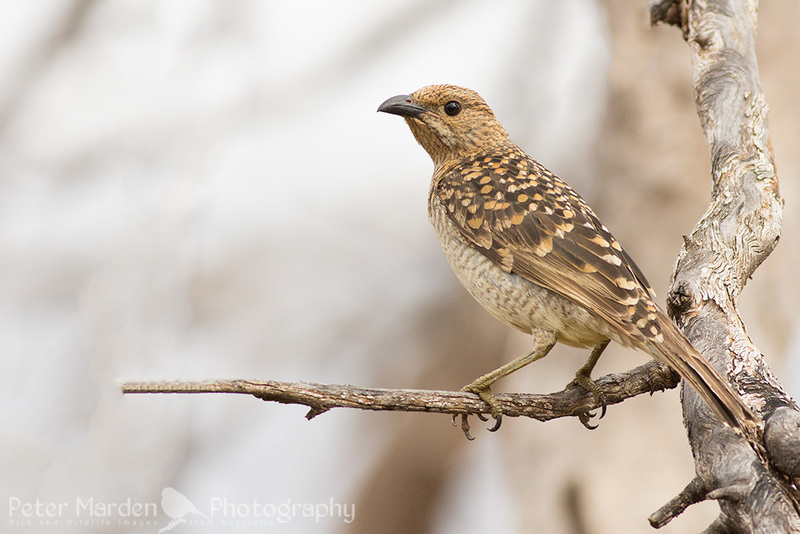 A Spotted Bowerbird, Spotted Dove and a Spiny-cheeked Honeyeater. Richard had caught up with me by this time, we spent a short while looking around a bit more and then back to camp. Got what we needed for the look around the property. Toni Sherwin caught up to us before we left and told us to stay close as it was going to rain, so we only went about 6 K’s max distance from the camp area. Just as well as it did start to rain, but only near on lunch time, but before that we were getting some nice images of some of the bird and wildlife. We had to go back to camp for a few hours as the rain was getting heavier, but at least it was not a down pour. Once the rain had cleared we headed back out for some more chances at what was about. 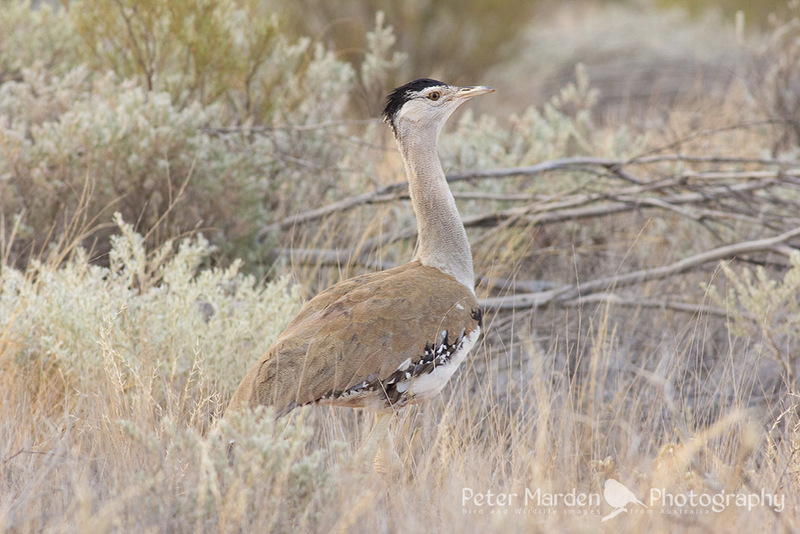 Australian Bustard, these are a large bird that fly, they stand about the 1.2m high and have a wing span of 2.3m. By this time it was getting dark again, it was late in the day and the sun was starting to set on the horizon, so we headed back toward camp. 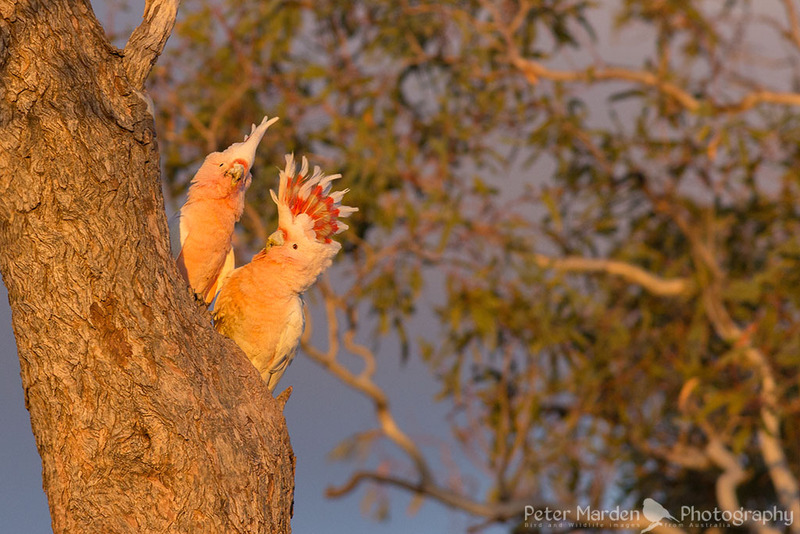 We had gotten to a creek crossing and saw a few Major Mitchell’s Cockatoos in the trees, so we got out the car and started to try get into a position that the sun was behind us and in front of the birds. The light was really starting to go golden, we had no problems getting around to the front of them for a change. This is where day 2 on Kilcowera pretty well finished for photography, as the light had deminished and time to cook a meal. The weather was still pretty bad, the wind was getting stronger and we had no awning due to the strong winds during the day. 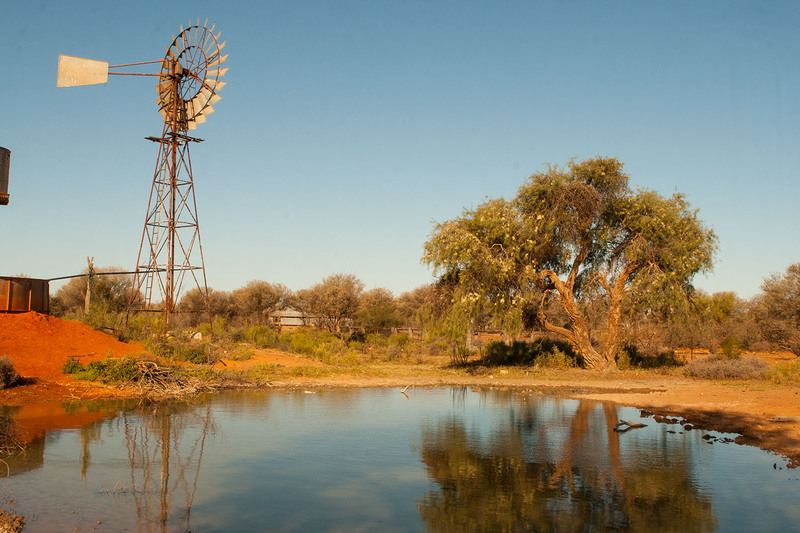 I got up around the 5:30 to 6 am mark, put the kettle on and had some brekky, we had decided to head off to lake Wyara, as this trip through Kilcowera was a 60K round trip it was going to take us quite awhile. We would more than likely have many stops. 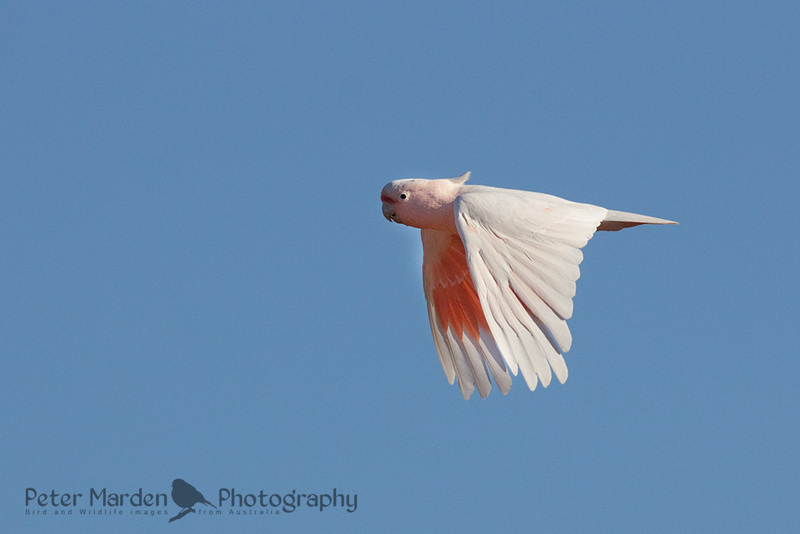 As I was getting things sorted, I saw a Major Mitchell’s fly over the camp, got a quick grab shot. Then we were off on our way to Lake Wyara. 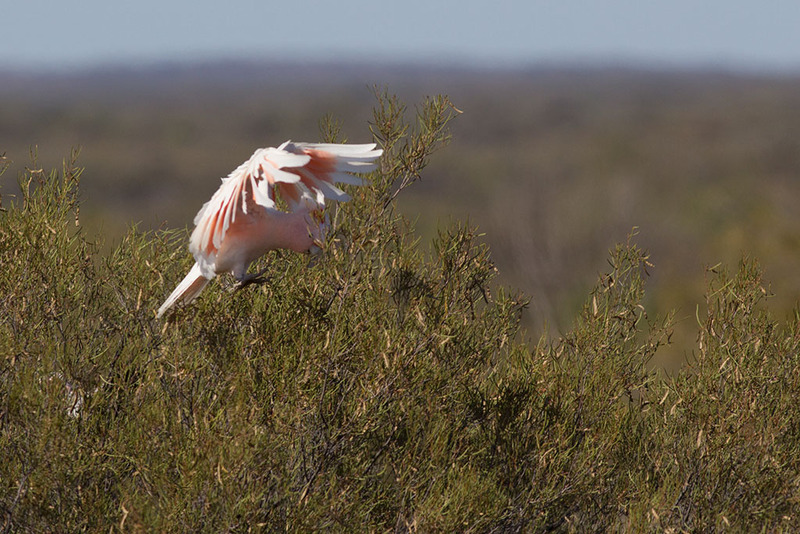 Quite a bit of wild life and birds around early on in the trip. 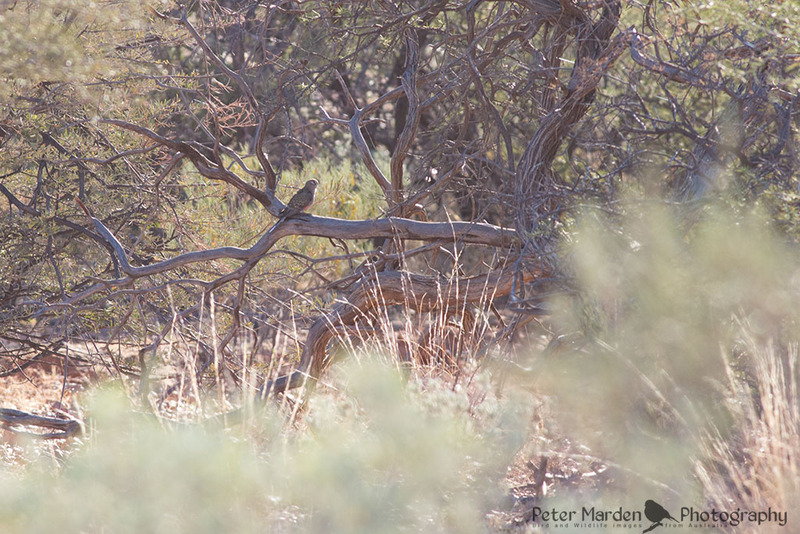 We had gotten roughly where we were the day before and saw some Major Mitchell’s in the trees along a dry creek line, We decided to get out and see if we can get close to the MM’s, but a luck would have it we had none and they had taken off. 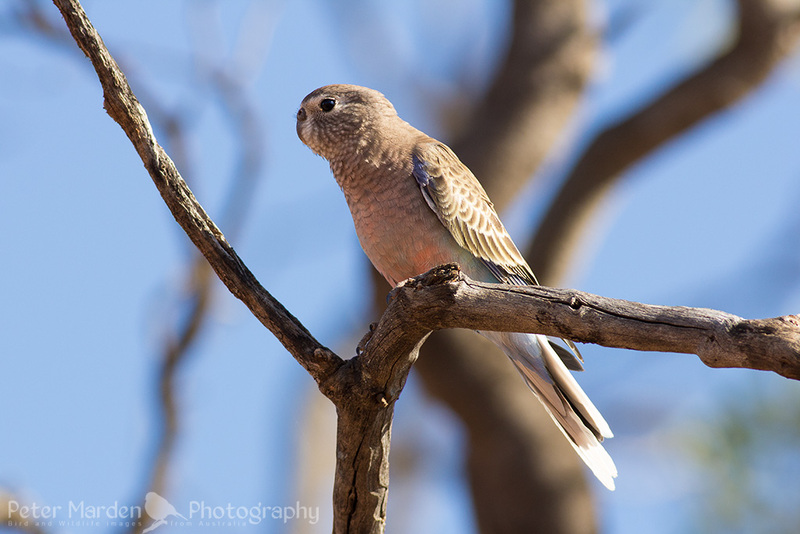 As this happened we heard and saw some parrots, very quiet noises from the parrots, like they were wispering, but no it turned out to be Bourke’s Parrot. 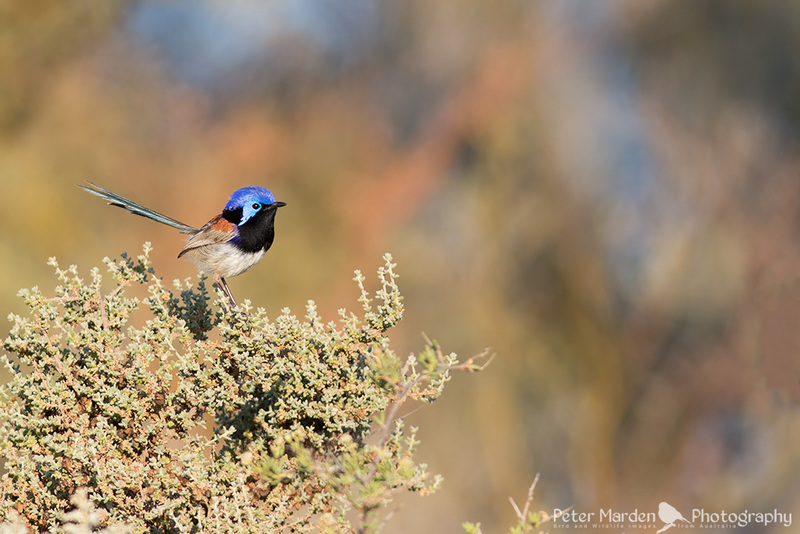 What a sight, as we got closer they took off and flew about 200 metres away into some trees on a small rise in the gibber plain. I had gotten a couple of long shots off just incase this was all we would have seen of them. 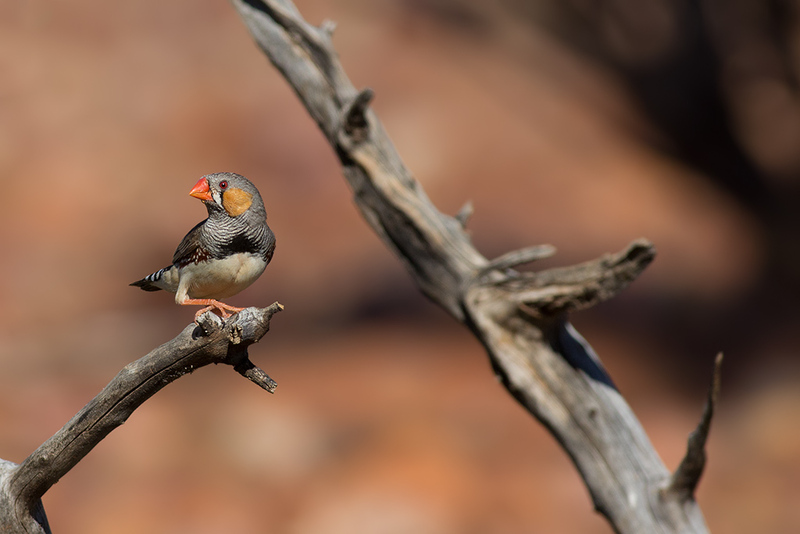 We saw quite a few Zebra finches along the dry creek bed, as a matter a fact there were heaps on the property anyway. 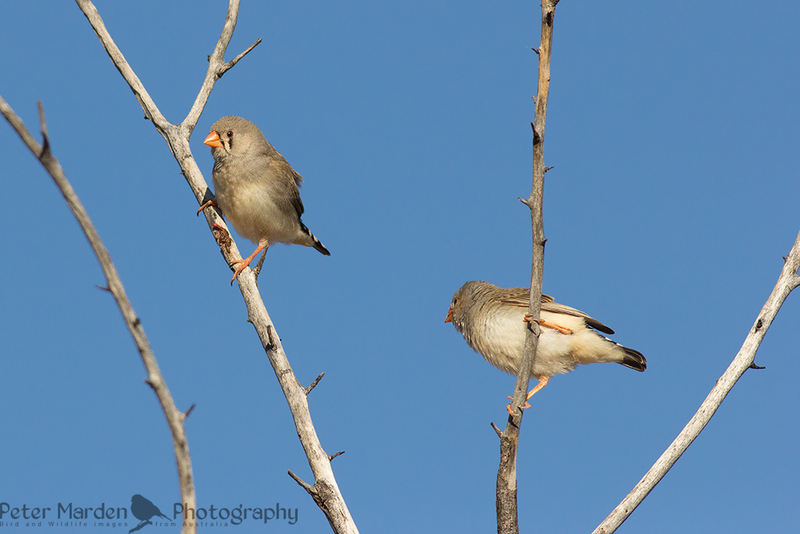 So we tried for a few shots of the finches, then we decided to try see if we can get close to the Parrots. 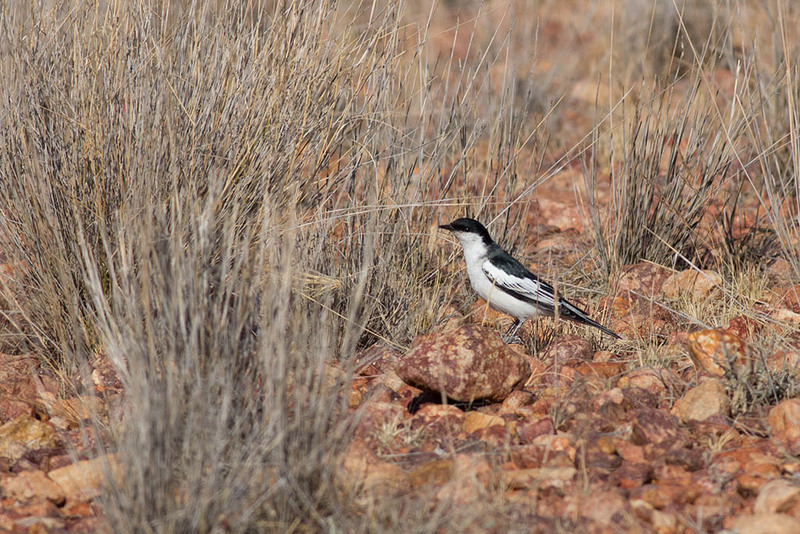 As we walked up the incline we saw a male Triller, he was quite happy to forage close to us trying to get a photo, he was on the ground and the plant matter was hiding him quite a bit. 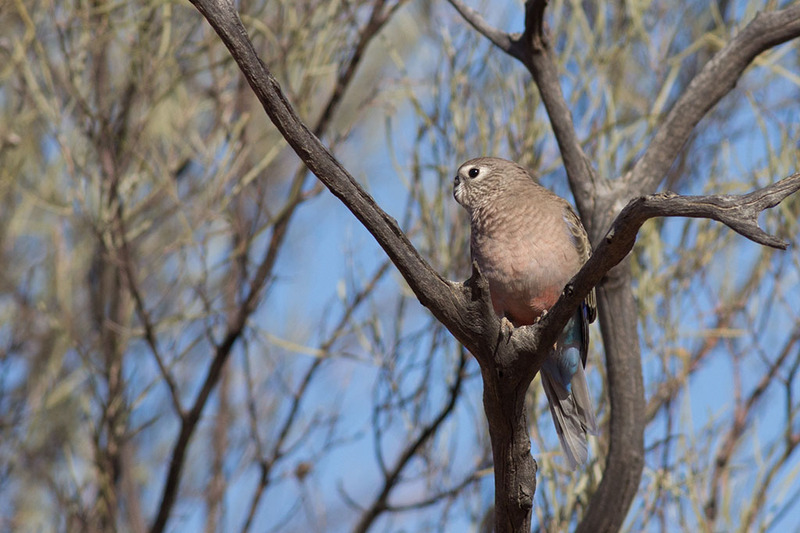 Then all of a sudden a he disappeared mainly due to the Yellow-throated Miner chasing him away, so back to looking for the Bourke’ Parrot. 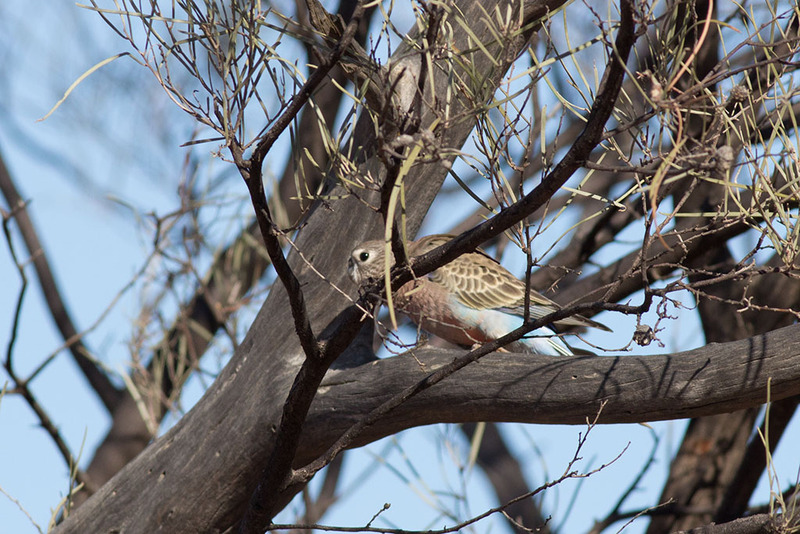 We found the Bourke’s Parrots not too long after the search regained. They were softly chattering to each other. The first image after finding them again, a large crop due to distance. Here is another image slightly closer and only about a 50% crop. The birds flew off again, they headed for the trees along the creek line again. So off we went to see if we can improve on the shots we had. We got some great shots, but not as good as we wanted due to light and us being on the wrong side of them, but what can you do. After awhile we headed off again, ( on the way back through we stopped for a few images of the terrain). 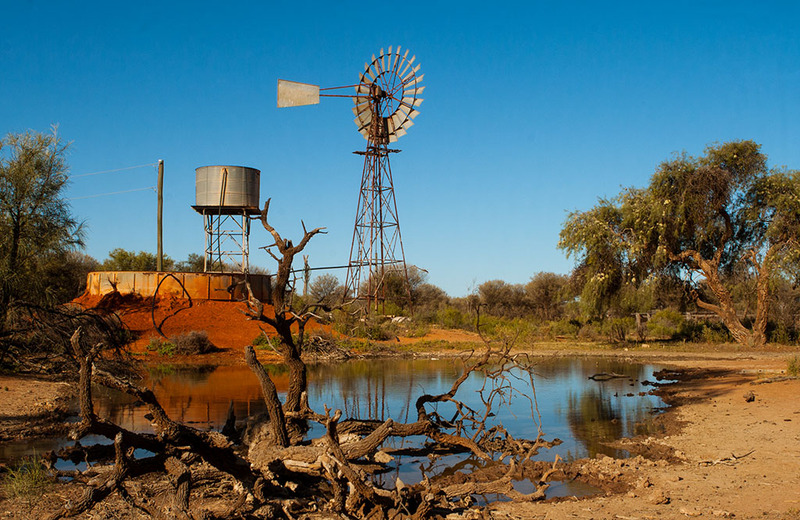 This is the area that the Bourke’s were found. Great red dirt through out the station. Onward we went, we had not gotten too far when we saw a few Major Mitchell’s feeding in some bushes off to the right of the track. I stopped for some images. 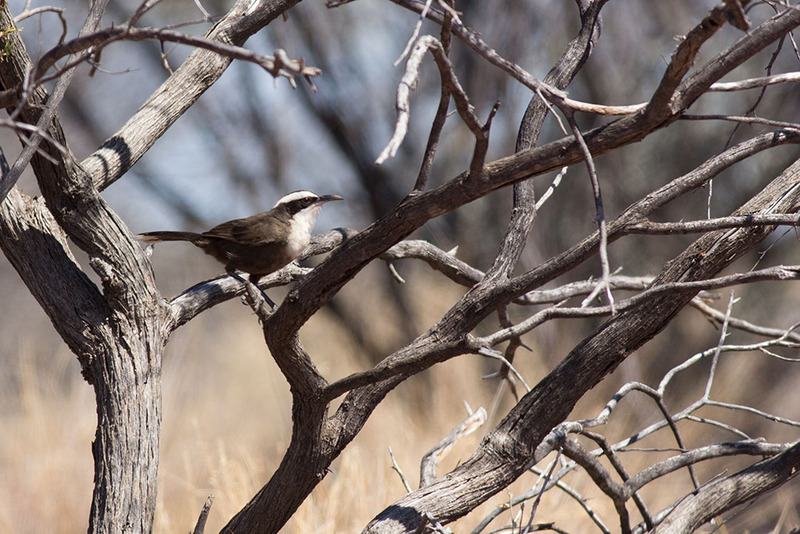 Jumped back in the car and went another 15 minutes or so up the track, and we heard some Babblers. 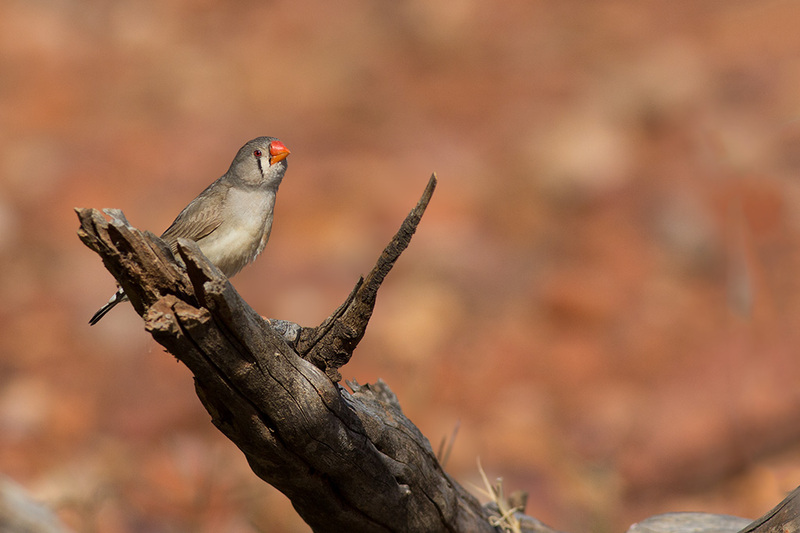 They sounded a bit different to what we were use to, we tracked them down and saw that they were Hall’s Babblers. Nice to see would have been better with closer views. We tried to get close but it just was not happening. So we were back in the car heading once again towards Lake Wyara. We had to pull up again no too far up the road, for the whole time travelling so far we had been hearing GST’s, so we got out again to check this one out and the creek line. Whilst out I took a photo of the back end of the car, it sure was a nice shade of Red. I am not sure how long we travelled up the track this time but we ended up stopping for a bite to eat near a big creek and old mill. Some bird life around but nothing we could lock the cameras on. too far away or too high. 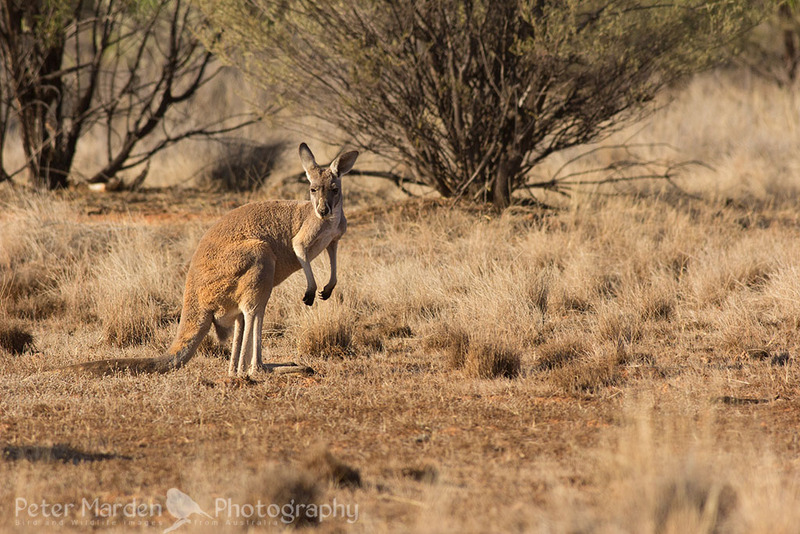 Grabbed a few shots of the Kangaroo’s that were around the area. We travelled a bit further again and not too far off the Lake we saw this Fella. 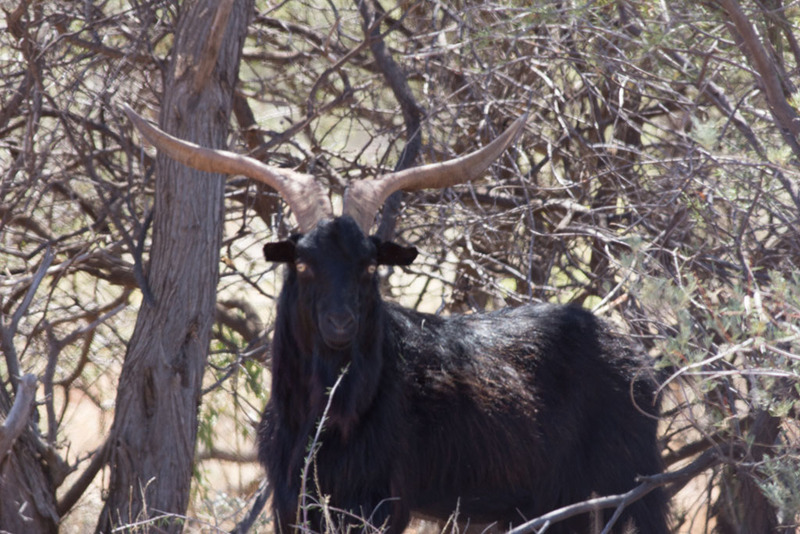 He was sure looking a bit tough, not wanting to leave the shade, but waiting to see if we got out the car, we did not. 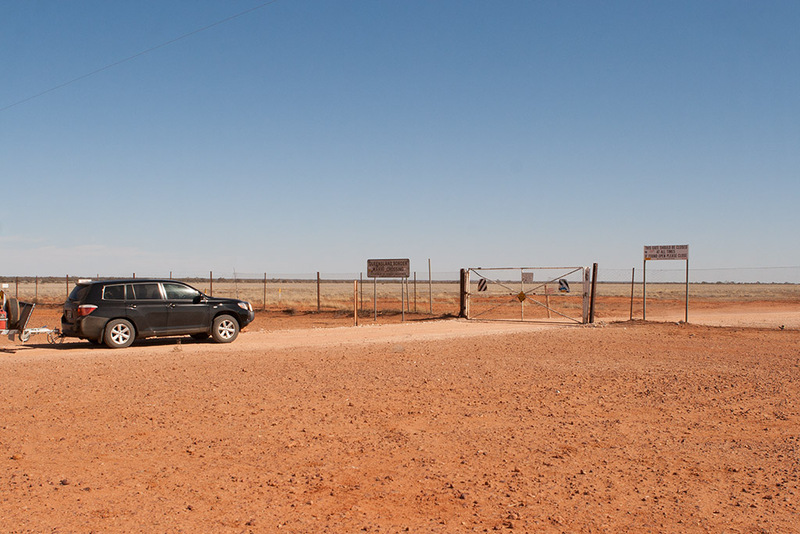 We had finally gotten to Lake Wyara, went through the gate and on to the car park. The water was low, still a lot of water, but it would have been at least a 2 K walk to get to the water. 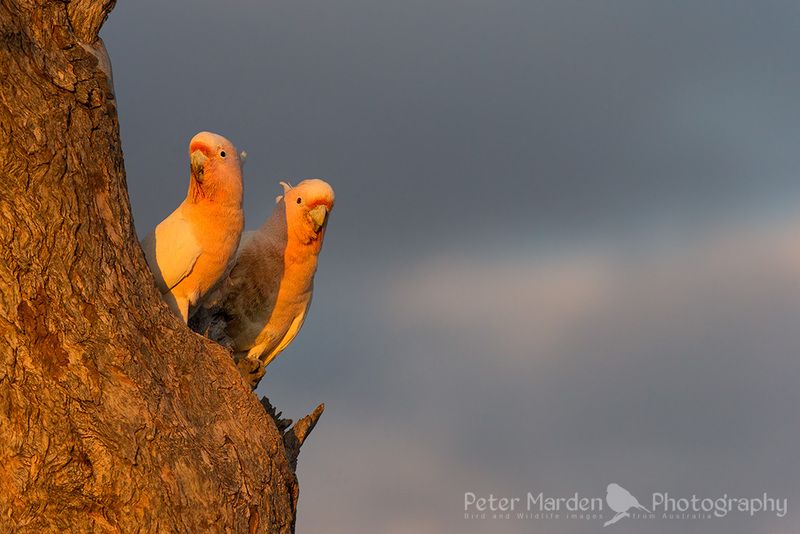 We went near on 1 K when we saw some Brolgas, Cockatiels and other birds. It was quite warm all the birds and animals were not as silly as us and were in the shade. We jumped back in the car and headed back toward camp, 30ks to go. we took a different route, on the way back, we wanted to see a bit more of the property. 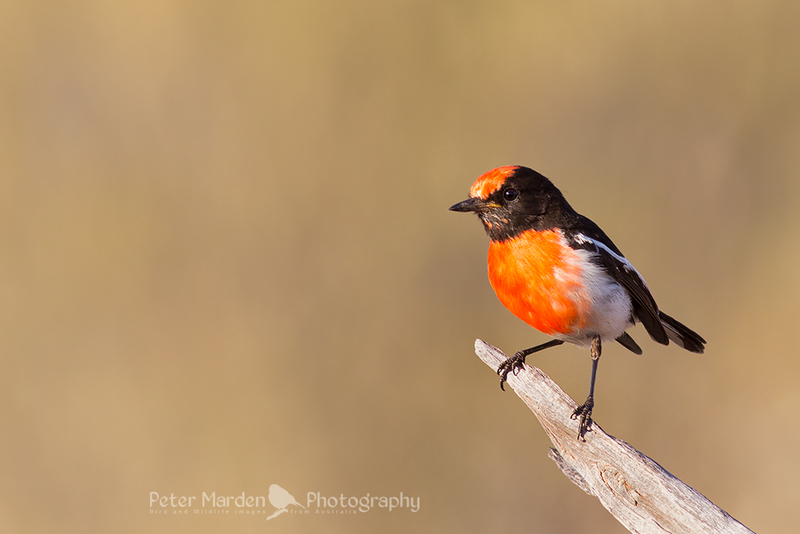 Welcome to Peter Marden's Photography blog. 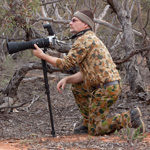 I am fanatical about Bird and wildlife photography, I have been to a few places to do wildlife photography, the blog is about some of those trips to get a few new species of bird. I have finally put together a web site for my photography, so you may wish to head on over there to check it out. Check out my Blog, to see what I have been up to.